What is the Best Pressure Washer Pump Type? What is the Best Hose? How to Use a Washer? What is a Foam Cannon? What Kind of Washer to Wash a Car? How Do You Detail a Car? A pressure washer is an ultimate tool that helps to remove dirt from almost all surfaces along with dust, mold and other types of unwanted substances. I want to share my experience on how to choose the very best pressure washer for cars. High pressure is of huge help when removing the stubborn dirt. Although the best pressure washer is mainly used for washing cars and driveways, but at the same time, these are also used for cleaning parts of the house, patios and desks. I’ve spent couple of days to summarize my experience and highlight best pressure washer for a car to help you save money and time! 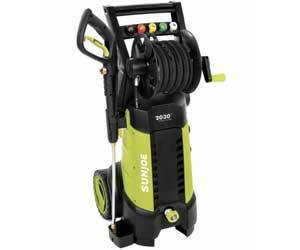 Sun Joe SPX3001 is a compact and portable power washer with the pressure of 2030 PSI and the water flow of 1.76 GPM. Besides, the large wheels and top carry handles of this device make it ideal for carrying from one place to another. It is also available with five quick connect spray tips, which allows the users to exactly adjust this unit for what they need like for the grimiest heavy duty cleaning job or the light jobs. SPX3001 has plenty of power to clean any patio or deck efficiently within a short span of time. The hose is long enough to reach to the gutters as well as to move around the vehicle without the requirement of going back to the unit to move it. This device is capable enough for removing mildew, grease, caked on mud and other grit and grime from decks, concretes, barbecues, siding, and other surfaces. 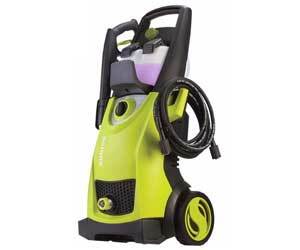 The new Karcher K1700 is an electric pressure washer, which is capable of delivering consumer driven best-in-class features for improved cleaning. Features like oversized wheels, integrated metal extrusions, and robust design allow users to take this product wherever they need. Other important features are tall handle, high cord wind, removable detergent tank, bucket storage bin and a modern footswitch for switching on or off this device. Standard M22 hose connections and general quick-connect wands accessory usage as well as simplify nozzle. 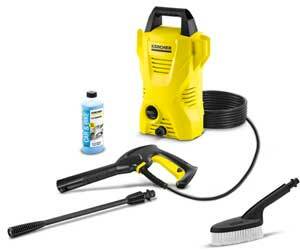 Karcher K1700 is capable of cleaning as effectively as it is expected from a pressure washer of 1700 PSI. 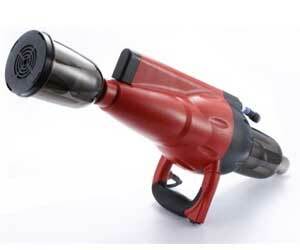 Therefore, this is ideal for cleaning concrete and wooden walls, driveways, fences etc. But it is not capable of peeling of the paint, cleaning things at the height of 2 storied or getting rid of the deep stains. 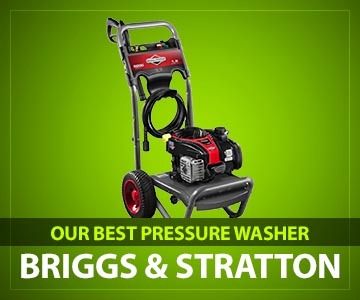 This is one of the most popular models of Briggs and Stratton pressure washers. It comes with a detergent injection method, which infuses some cleaning solutions into the water flow while offering the user 3 spray tips. The maximum pressure offered by this device is 2200 PSI and therefore it is capable of offering a powerful service even after being really lightweight. This is a Vertical Shaft washer, which mostly makes the outdoor cleaning jobs stress-free and speedy. It is designed with three quick connect tips, which are capable of offering versatile spray patterns starting from a wide fan spray to a fine jet stream. 1.9 max GPM offers powerful precision and power control while working. Besides, the maintenance-free axial cam pump comes with easy-start technology, which ensures fast start-up every time. This pressure washer is ideal for washing trucks, cars, patios and siding and also for blasting away the stubborn driveway dirt. In fact, with this power, it is actually possible to deal with almost any type of outdoor cleaning projects. Besides, it’s spray tips offer more performance, versatility, and power. Before writing the review, I really wanted to run the machine through a few tests and also make sure some of my friends did the same. We were looking for a solution that was higher build quality with better specs than what we were able to get at the big box stores. We also wanted something that was clean and professional looking, preferably wall mountable, but still portable. So, a few quick specs. It’s an electric pressure washer that’s built and manufactured in Italy. There’s 1300 psi of pressure, which I think is actually the ideal amount of pressure for washing your car safely. It also has two 2.2 gallons per minute of flow, which with that kind of flow I’m able to make a perfect shaving cream foam with a foam cannon for the pre-wash and also efficiently rinse off the vehicle when I’m done. It has an all solid brass pump with a triple piston axial design. I did some research and that leads me to believe that I’ll get a long life out of the pump, and it will require little to no maintenance. It features total stop technology, which essentially just means that when I let go of the trigger on the spray gun, the pump will stop running. That will make it quieter when I’m using it and also will result in less wear on the machine. Since it can run off 14 amps of power, you’re pretty much safe plugging it into any outlet you can find. One of my favorite features of the machine is obviously that it’s wall mountable, but it’s also still portable since I can easily take it off the wall in about 10 seconds. I just have to unlatch these orange latches in the back and press on this orange button in the front and the whole thing will come off of the wall. The other thing that I really like is that included reel has a 70 foot hose. I’ve you ever had a machine that a short hose, you know that it’s a real pain to have to keep moving it around ’cause you can’t make it around the car in one shot. It can also run on a gravity fed water tank, which means if you’re a mobile detailer, this is a really great solution for you. For all its worth, it would be a poor choice indeed if our freshly bought pressure washer remains limited in its use. 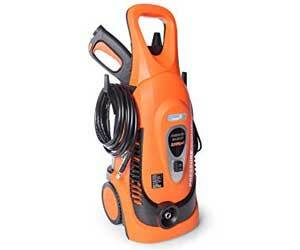 However, I would like to introduce you to the DBPower Pressure Washer that conveniently solves your hesitations. Like every pocket pincher, I used to balk at a purchase that was limited to just my vehicle. But then I realized that I could easily use it for three separate steps to clean my car as well as my kitchen slabs. You can begin with a thorough foam wash, followed by drying the stains and then end with a good vacuum. More importantly, while making a purchase, it’s the little thoughtful additions that always convince us at the end, right? Regarding this foam washer, what really impressed me was the Safety Waterproof Switch, which protects the switch against any stray water. It is impossible to keep your hands dry while washing your car, and I have tried to do so. This will negate the need for constant caution on your end. Another such detail is the soft silicone nozzle. As enthusiastic as we can get while trying out a new washer, it is liable to scratch our car very easily. The absence of a harder metal or plastic solves this issue as well. But of course, that is not why this falls on my recommendation list. I know you are trying to figure it out from the bigger perspective. Let me assure you that 12Mpa motor with a maximum PSI of 1740 won’t fail you in either of its purposes. It will suffice for the strong wind that a good drying will require for avoiding the pesky water stains. And it also works in favor of the vacuum. This is more of an all-in-one product that will solve half of your car-washing purposes. However, not on any level is it a professional foam washer. Nevertheless, for someone who likes to wash their vehicles at home rather than employ professionals for it, it is a good choice. K1900 delivers features like over-sized wheels, metal extrusions, and complete robust designs that help users to carry the product wherever they like. Some other great features of this pressure washer include a tall handle, high cord wind, space-saving rotating handles, bucket storage bin, innovative on-off foot switch and removable detergent tank. K1900 is one of the most popular types of pressure cleaners known for offering unparalleled ease of use and premium quality cleaning performance. As this electrical pressure washer is capable of delivering 1900 PSI of pressure, this ensures that users only get the highest level of cleaning service whenever they use this machine. It’s just perfect for cleaning some large surfaces like decks, patios, terraces and driveways. Besides, these are also used for cleaning trucks, SUV vehicles, cars, boats and RV’s. SPX3000 comes with a 14.5 Amp high power motor, which is capable of putting out 2030 PSI pressure allowing it to spray around 1.76 gallons of water per minute. As a result, it can successfully remove salt, dirt, and mud. The rear wheels make moving this device around really convenient. It’s also capable of removing rust from steel, oil stains, grease and tar from concrete, heavy mildew stains, caked mud on the equipment and other immovable gunk and grime. It offers both high pressure and low-pressure spray. The low-pressure spray is ideal for cleaning the car, but high pressure is required for fighting with the stubborn stains, gunk and grimes. 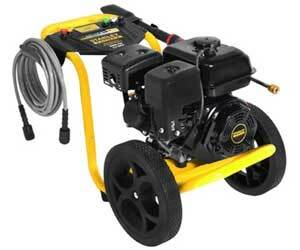 Ivation is a cored pressure washer, powered by one 1600 watt, 14.5-amp motor. Besides, this device also comes with the TSS technology, which is very efficient in water saving. Self-suction function, 5 interchangeable quick-connect nozzles and one foam nozzle with different types of wash heads are also worth mentioning. All these features allow you to clean different types of surfaces and outdoor items without any hassle. It is capable of pumping out 2200 PSI, producing 1.8 GMP while using 110 to 240 Volts. Besides, the poser cord of this device comes with a GFCI plug with 30 feet length and this ensures convenient cleaning. Ivation is just ideal for performing cleaning jobs in the homes, boats, cars, RVs, decks and driveways as well as cleaning different types of surfaces with the maximum pressure of 150bar. 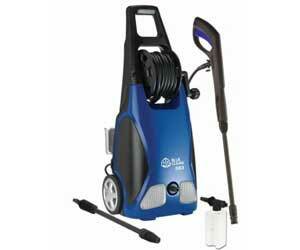 The AR Blue Clean AR383 is the ideal cleaning tool that one can have in a seemingly compact package. This device comes along with a complete kit that includes a high-pressure hose, an adjustable jet nozzle, foam dispenser and an all important gun. Besides, this device also comes with a Total Stop System or TSS, which can add more power to the washer. It is made of aluminum, copper, and plastic. This device can put out 1900 PSI pressure, which is enough to pump out 1.5 gallons per minute. With the easy to use instructions, it is just perfect for spotless cleaning jobs. The best thing about Ar Blue is that it comes with an attachable foam/ soap bottle as well as an automatic safety valve with power shut off at the head of the pump. It is powerful and easy to use even with the stiffness in the hose. So, by choosing this device, you will be happy to see the cleaned exterior of your car. This is an entry level pressure washer model, where the key figures are 110 bar pressure, which is powered by one 1400-watt air cooled motor, generating the workflow of 1.25 GPM. It also packs adequate power to deal with car cleaning, washing leaves off the pathway and washing the patio furniture down. K2 is not just lightweight and compact, but it also comes with different types of accessories, which are perfect for a range of jobs. This device is well equipped with a highly powerful motor with built-in air cooling mechanism which ensures long life for the washer. Besides, this pressure washer also comes with an automatic stop/start motor, which helps to save power and a detergent pipe which is ideal for cleaning murkier dirt. Being an entry level pressure washer, Karcher K2 is good enough to get the vehicle shining. The compact, light-weight and easy to setup features make this strong enough for removing dirt and stain from the car. Apart from being a car wash, this pressure washer is also beneficial for washing garden furniture, cleaning bikes, washing down small patios and pots and removing leaves from the patio. This is a 3400 PSI pressure washer manufactured by Stanley which is capable of producing 2.5 GPM for effective cleaning. Besides, it also includes a robust gasoline engine that offers some really dependable power. This is a gasoline powered premium quality pressure washer, which is designed to offer a great efficiency with the skilled high quality. This device is mostly used for car washing. Besides, this can also be used for some other household jobs like cleaning walkways, patios, sideways, driveway etc. 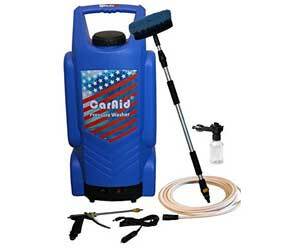 This unique pressure washer manufactured by Caraid is designed specifically as a multi-purpose vehicle washer. This pressure washer is rated at the pressure level of up to 130 PSI and therefore this is unable to offer an aggressive power pressure for cleaning. Caraid has a large water tank and it is power-driven by 12-volt DC. Therefore, this is the ideal choice for people, who live in apartments. Besides, this device is highly portable with a built-in water tank of 8.5 gallons. It is designed for cleaning the cars frequently, apart from it Caraid Portable is also used for the camp sites, gardens, beaches or cleaning patios and windows. What is the best pressure washer hose? What is a Good PSI? There are basically three types of pressure washer pumps, and they all fall under the reciprocating positive displacement group; reciprocating pumps use either the pistons or the plungers to disperse water. The pumps that use pistons mainly have the cylinder seal connected to the piston which moves with it on each stroke. With the plunger pumps, the cylinder seal is fixed. The plunger pumps are driven by a drive shaft whereas the plunger ones are driven by a crankshaft. To decide whether one pump is the best, we have to look at its overall performance such as the efficiency, higher pressure and flow rate. These pressure washer pumps are known as wobble, triplex plunger and axial cam pumps. Amongst them, the triplex plunger is driven by the crankshaft. Looking at the performance characteristics, the drive shaft driven pumps lack in efficiency compared to the crankshaft driven pump. This, therefore, leaves the triplex as the best and most efficient pump. The wobble commands a flow rate of less than 2 gallons per minute with a pressure of less than 2500 psi while the axial commands a pressure of less than 3500 psi. The triplex pump, on the other hand, has a higher pressure over 3000 psi, which makes it is the ultimate winner crowned the best pressure washer pump type on the market. The choice of the pressure washer hose is not as straight forward as the pump types. Not all hoses fit all pumps. To be on a good side, check the features such as the diameter, the length, the materials, and connections of the hose. Diameter: The diameter of the hose can give you an idea about the maximum pressure allowed. Typically, you’ll have a small diameter that is ¼-inch which is best-suited to hoses with pressures up to 2700 psi; a medium diameter sized at 5/16-inch rated for hoses up to 3400 psi; and lastly the 3/8-inch diameter suitable for the higher pressure up to 5000 psi. Length: the length of the hoses will differ. If you want to from a distance, I recommend a longer hose. This can also depend on the type of the pressure washer. For instance, an electric machine may need a longer hose due to its limited mobility since it has to be plugged on the wall socket. A diesel or petrol pressure washer is mobile, and so a shorter hose wouldn’t be that bad. Connections: check if the hose will be compatible with your machine. Some snap into the machine while others need screws. Build materials: there are various materials used to manufacture these hoses. Typically, you would find rubber, PVC, and polyurethane. What matters with these materials is flexibility plus durability. In others you may have to trade some features. For instance, PVC plastic is hard but not flexible, while rubber is flexible but not hard. Pressure washer machines come with either attached or built-in soap dispensers to make cleaning effective. The best depends on your preference or your freedom to add any brand, and also a reputable brand. A further choice may involve the soap or the detergent. I would recommend choosing the soap as it is more effective and biodegradable. Pressure washers are capable of blasting things clean aggressively with water jets that are pressurized at almost 75 times the pressure of any garden hose. Sometimes, these can also spray gently with lower pressures for the purpose of delicate cleaning. Therefore, the pressure washers ease the tough cleaning jobs while solving other issues like as removing blistered paint or flaking. Then the pump shoots out the soapy, hot water through the high pressure, reinforced exit hose and the attachment that is fixed onto it. The attachment mainly has narrow nozzles on it, which helps to increase water jet pressure even more. The high pressure of these jets doesn’t only cleans the vehicle effectively, but this also helps to waste 80% less water than using a low-pressure ordinary hosepipe. Cleaning a car with a pressure washer is much easier than hand washing as this uses lesser water than the conventional hose pipes. Here is a step by step guide to do it. Rinse off the vehicle’s top layer of dirt: In case you are using a machine with variable jet spray, then adjust the machine to a spray of about 5-8cm wide. This spray will be strong enough for cleaning the car without damaging the paintwork. For the lights, windows and other fragile parts of your vehicle, it is important to use a less powerful and slightly wider setting. Use a detergent: Set the nozzle of the pressure washer to the least powerful and widest setting or remove it completely to coat the entire vehicle in the layer of a detergent. Let the magic of detergent work for several minutes, but don’t wait until it gets dry. Otherwise, your car will be left with blemishes, which you need to buff out, therefore. Loosen all the stubborn grease and dirt: Next you need to use a separable car brush to perform the job quicker. In case you are using the same brush to clean the wheel arches, wheels and the paintwork, clean the wheel areas last as while cleaning these areas, there is a high chance that the brush will pick up grits and small stones from different parts of the wheels and you must not want to rub these things again against the paint. Thoroughly wash the brush once you are done. Rinse off the vehicle by using a high-pressure jet setting: Next thing you need to do is to rinse your vehicle off by using a high-pressure jet setting. Even in this time use a comparatively less powerful setting for the glass areas than the paint. In case you don’t have a changeable nozzle for adjusting the width and power of the spray, then just maintain a distance from your car and then spray. One meter will be a safe distance of stay away from any damage. The water pressure of a pressure washer is mainly measured in PSI or Pounds Per Square Inch. Counting the PSI is important for breaking the chemical bond between a stain and a surface. Stronger the chemical bond will be; more pressure will be required to remove it. The pressure output in the PSI of a device works as a major factor in deciding the type of duties this can handle effectively. So, here are the good PSI levels for the pressure washers. 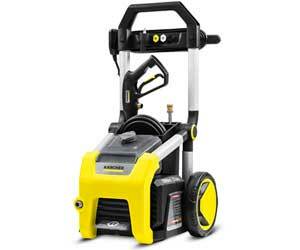 Professional duty or extra heavy duty: These pressure washers are capable of generating 3300 PSI and up. Therefore, these can deal with most of the jobs of other machines. But for paint preparation, more power is required. 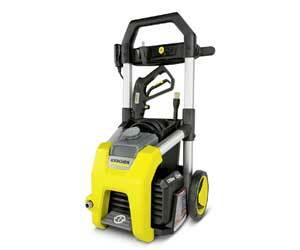 Heavy duty: These pressure washers can generate almost 2900-3300 PSI. Therefore, these are just ideal for different types of cleaning jobs including small parts like sidewalks and large parts like driveways. Besides, these are also ideal for the jobs like second story cleaning and for preparing surfaces for painting. 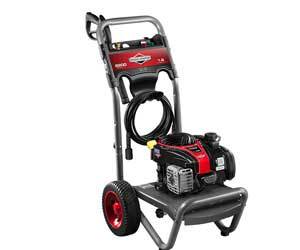 Medium duty: These pressure washers can generate almost 2000-2800 PSI. Therefore, these are able to deal with the same cleaning projects like as the light duty ones, but these are just perfect for decks, fences, patios and sidings. Light duty: The pressure washers of this category are rated less than 2000 PSI. These are ideal for cleaning siding and patio furniture along with boats, trucks, and cars. Besides, these are also used for cleaning driveways, sidewalks, fences, patios and decks. Light duty: Most of the domestic or commercial pressure washers are designed for the light duty usage. As these washers can produce maximum 2000 PSI, therefore, these are just ideal for basic household tasks. As a result, this type of pressure washer is considered to be the best for washing cars and trucks apart from performing other cleaning jobs. Medium duty: Medium grade PSI output is mainly produced by the high-quality commercial pressure washers and most of the semi-pro pressure washers also deal with this type of output with complete ease. The PSI output level of this type of pressure washer ranges from 2000-3000. Therefore, this type of car washer can also be used for washing trucks and cars. Apart from the PSI rating of the pressure washers, it is also necessary to pay attention to the volume of water that the machine actually delivers and it is measured in GPM or Gallons Per Minute. While higher PSI is capable of offering deep cleaning, higher GMP ensures better rinsing and cleaning of all the difficult-to-reach areas. Cleaning power of any pressure washer is determined by both GMP and PSI ratings. Better the combination of numbers, the more area will be cleaned efficiently by these washers. Two pressure washers may have the same PSI level, but the one with higher GPM would help you to get the job done faster while saving both time and electricity or gas. Pressure washers mostly rely on large water volumes to clean different surfaces while getting rid of the dirt and grime. While compared to the ordinary garden hose, water from the pressure-washing unit is capable of clearing all the debris within a short span of time. Because of the efficiency, less water is wasted. Although in the majority of the times, average pressure washers use almost 8 gallons of water per minute. So, a pressure washer with almost five GPM is considered as efficient. But to do the job efficiently, the pressure would need to increase starting from 10 pounds PSI to 50 PSI. 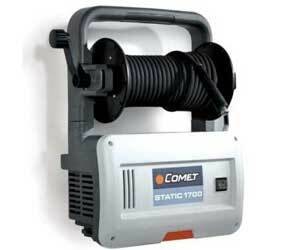 A few pressure washers are also capable of blowing very intense pressure at almost 1500 to 2000 PSI. Pressure washers spraying with that much pressure can actually blow away anything at the decreased water volume. Foam cannons work on the lock and foam method, which can give the cars a great touch free wash without the requirement of scrubbing. One just needs to add a foaming car wash soap to the cannon and it will be ready to spray away. Foam cannon basically covers the vehicle with thick snow foam, which can successfully remove debris, oil, grease and dirt without touching the surface. This thing decreases the chance of creating scratches and holograms caused by rubbing dirt into the vehicle’s painted surface. Besides, foam cannon is also capable of removing grime from small cracks and crevices by using the latest and most innovative air injection technology. Once the process is done, it is necessary to rinse and dry the vehicle. The entire process will help to wash the vehicle within half the time while compared to the traditional methods of car washing. Most foam cannons are capable of creating up to 60 to 90 PSI to clean the vehicle by using an unbelievable amount of foam. Cannon needs a pressure washer with the flow rate of 1.5 to 5.3 GPM, either electric or gas. Besides, standard foam cannons come with quick release adapters that fit the majority of the pressure washers. There are different types of adapters available that fit to different types of pressure washers. With the right adapter attached to the foam cannon, it will be possible for the cannon to get attached to the pressure washer. These cannons also feature adjustable knobs to adjust the soap amount easily, which is applied to the spray mixture while adjusting the spray pattern. It’s best to use Pressure washer with a Foam Cannon. You might want to check our Foam Cannon Buyer’s Guide as well! The best thing is that there is a range of pressure washers available, which are safe for the vehicles. For example, do you like to have water and detergent mixed together while it flows from the pressure washer? If so, then you must like to have a pressure washer that includes onboard detergent tank. In case the user opts for a lower PSI like 1600 PSI, then the best option will be to choose a pressure washer with turbo boosting nozzle for cleaning harder areas. So, after figuring out the right PSI, the choice will almost be enormous. Most of the people agree that the pressure washers with 1300-1900 PSI don’t cause any damage. These pressure washers are known for easy handling and these also include enough pressure for dealing with the tough areas. Even the pressure washers with 2000 PSI can also be used safely for washing cars as long as the user is well aware of the power that the pressure washer offers as well as the ways to operate it properly. So, for the beginners, it is recommended to start off with fan spray setting and therefore to save the hard pinpointed spray for cleaning the toughest areas like as the undercarriage or tires. It is also necessary to consider the right GPM level like the total amount of water, which is coming out of the end of the wand of the pressure washer. A number of people suggest that a higher flow rate for the 1300 PSI pressure washer is much better than comparatively higher PSI and less water coming out of that. But in case you use a pressure washer with less GPM, then the user will not have to waste much water and this will be a great bonus. The way one chooses to go about will be based on his/her personal preferences. Car washing is considered to one of the most important car detailing steps. Not only this helps to prepare the foundation for all types of following detailing treatments, but this also allows the vehicle owners to maintain the results of this work for a really long time. So, here comes a guide that helps one to achieve ultimate car detailing guide by following some steps. Often considered as a missed out part, the detailing stage is considered as the pre-wash stage, which is really important for obtaining swirl free car wash. The pre-wash stage of car detailing aims to remove all the light contaminants like road salts, road grimes and bug splatters located on the paintwork of the vehicles. It is also necessary to pay attention to all the more intricate and tighter areas during the pre-wash period. These areas include door shuts, fuel filter caps, window rubbers, and grills. In this stage, it is necessary to use a car cleaning material. But before choosing any, it is necessary to go through the label. In most of the cases, the application for detailer, soap or wax varies from vehicle to vehicle and brand to brand. Besides, it is also necessary to invest in premium quality microfiber clothes for windows, paint, and wheels. Wash the cleaning equipment after every use. After cleaning the dirt, the next step is to wash away the vehicle with clean water by using a pressure cleaner. This can be done using the two bucket method or by using a pressure washer to get a steady water steam. Rinse the vehicle from top to down by using plenty of water while allowing the water to sheet off of your vehicle’s paintwork. Next step is to dry the vehicle. It is necessary to take specific care on this step as this is where the paintworks mostly get inflicted. Therefore, it is necessary to follow a gentle and methodological guide while drying a vehicle. Begin at the top and then work down the way. Wipe the surface gently by using a jumbo microfiber drying towel. Besides, the surface can also be pat dried to decrease the chance of damage. Or you can even use a detail spray or a quick detailer on the washed paintwork for adding a little bit of lubrication. So, it is obvious that pressure cleaners are capable of replacing different types of household tools, therefore purchasing it is undoubtedly a great investment that will pay off in time. Apart from eradicating the requirement of other cleaning devices, having the best pressure washer for a car means the owner doesn’t need to spend money on some chemical solutions. Here the only thing that one needs is water. Now you’re all set to choose your best pressure washer for cars.